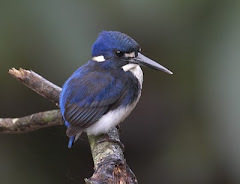 By the end of November Daintree had a reached over 4 metres of rain for the year - an extraordinary amount of rain for most of us who were brought up in much drier climes than these! There has only been minor flooding though, but it won't take long once the 'wet season' arrives in a month or so - the ground is well and truly saturated now and will not hold big inundations. Birding has remained interesting though, with good numbers of summer migrants about. 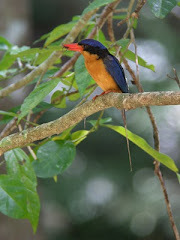 The Buff-breasted Paradise Kingfishers are excavating the termite mounds, Black Bittern have chicks on their nests along the river, and Metallic Starling juveniles are busily helping with the next generation. Rufous Owl have been seen in the garden at Red Mill House on several occasions in the last month, and a reported family of three Rufous Owl at Jindalba Boardwalk took us out looking for them early one morning. No owls, but a lovely Southern Cassowary family, dad with two chicks, not worrying about us at all as they slowly moved through the forest feeding on fruits. A wonderful sight! A good ten minutes of watching before they wandered off.